One of the new features that the Land of the Dead will be bringing us is Vessel Weapons. These are weapons that are less powerful by default but offer more in the way of customization than other weapons in the game. They come with a dps value, a single stat and multiple Talisman/Soul slots. Here you can see two vessel weapons I won in blue bags. NOTE: This information if off of PTS so it is subject to change. Basic (blue quality) vessel weapons can also be purchased off of a vendor in your warcamp. They have versions for Rank 31 and Rank 40 available. 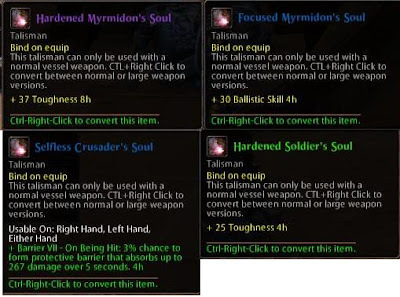 One handed weapons get 2 Soul/Talisman slots while Two handed weapons get 3. Before you slot a soul in a two hander, you must convert it to a large soul. This will normalize the power of the soul to take into account that dual wielders will get an extra soul slot. A soul is basically a souped up talisman. Much like stars that burn bright, a soul will usually last a shorter time than a talisman. They also offer different benefits. 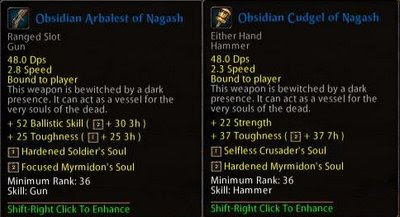 For example, souls can add proc effects to your weapon. You can obtain souls from vendors using scarabs or from loot drops throughout the Land of the Dead. You can place old world talismans into these slots as well. However, you cannot place souls in old world weapons. 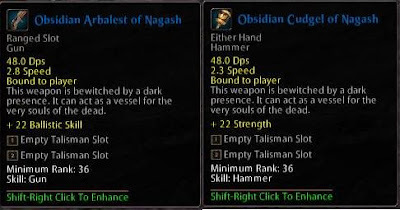 I cashed in some scarabs and got a lucky loot drop (the epic soul) to get the following talismans. There are numerous souls to choose from, so you do have a nice amount of options. This adds some nice customization aspects thanks to the proc souls. This should also keep the Land of the Dead relevant for a long time to come as players need to replace souls. I wonder if we will see this system applied to armor sometime? The guild I am in is doing some extensive testing on Tuesday. I hope I get the mount. Eh, I'm not a big fan of the new mounts (for testers/recruit-a-friend). They are rather large. But they are fast. If I remember correctly, they are even faster than guild R37 mounts. I'd shudder to think of the tactical possibilities of a wb with those mounts. I had a pleasant surprise in reading your article as it had a very entertaining feel to it.